Facing Saint-Louis jetty and Sète harbour, our hotel offers welcoming, contemporary rooms centred around natural light and the sea. 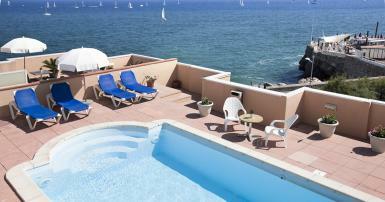 Its small, rooftop pool overlooking the sea is a wonderful sun trap. Renovated in 2014, our 55 rooms and junior suites overlook either the sea or the hotel's interior courtyard. We also have family rooms for up to 6 people. During your breakfast, you will enjoy the panoramic terrace with spectacular views and admire the first light facing Mediterranean Sea. For older children and adults, an extra bed costs 19 euros per person per night (no food included). Children's menus are available in our restaurant, depending on your child's appetite. Avis laissé le 21 2019 par Jenny A. Only stayed one night, passing through area. Good location for walking to port or beaches. Ladies in reception very helpful and friendly. Room as described, spotlessly clean and comfortable. Parking on site was one of the reasons for booking here. A very good experience here, would definitely stop here again. Thankyou. Tea making facilities in the room would have made a perfect score! We english like our cup of tea in the mornings! Avis laissé le 06 2019 par John S.
Found by chance. Great location and view from room also great. Avis laissé le 09 2018 par Mande F. S.
Reception very friendly, also during night. Room cleaning very good. Positive: dogs allowed, garage boxes available. Negative: bodylotion was missing.